With Zapier you can sync your subscribers from your favourite email services or CRMs. Such as ActiveCampaign, AWeber, Salesforce, Zoho, etc. 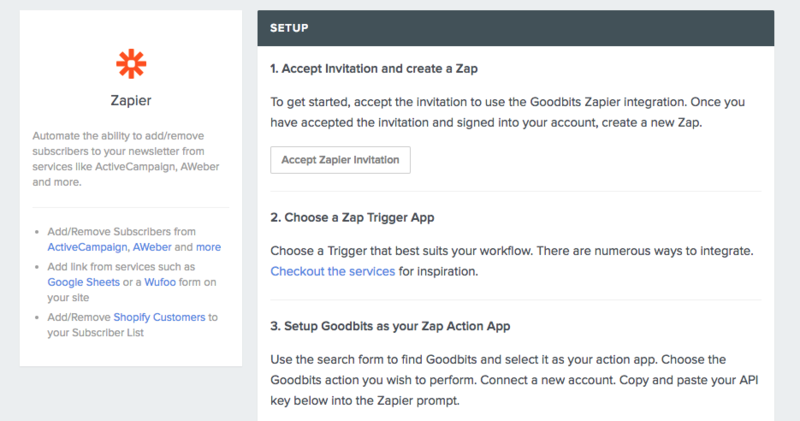 There almost 500+ applications connected to Zapier, so if you're already using one of them you can simply setup a Zap and integrate them with your Goodbits newsletter. You can also set up zaps to collect content from those services as well subscribers. Perhaps you want to offer your readers a form to submit content for you to include in your newsletter, simply setup a Wufoo form and direct the URL and information to Goodbits. The link will appear in your All Bits Bucket. To get started simply head over to the Zapier booster and follow the instructions.